A recent dog sitting experience in Ethel, Ontario, spurred me to check out the Maple Keys Sugar Bush Trail on Maple Keys Line. Although this site was once a location for maple syrup production, all that remains of this activity is a sugar shack hidden away in the trees along the 0.6 mile trail (AllTrails, 2014). For context, the woodlot is located in The County of Huron, Ontario’s West Coast, and is managed by the Maitland Valley Conservation Area (MVCA). Maple Keys is the most popular trail located within the Hullett Marsh, a Provincial Wildlife Area which is on the path of two major waterfowl flyways and provides one of the most spectacular wildlife habitat developments in Eastern Canada (Friends of Hullett, 2014). Topography of the trail can be rough in some places, and the two trail loops pass by plantation, wetlands, lowland, upland hardwood areas (Ontario Trails, 2014). The maples dominate, though there are also some beeches mixed in. It is an interesting trail to hike, as Ontario’s history and heritage is strongly influenced by the sugar bush and you can peak inside the abandoned sugar shack along the trail (Brennan, March 23, 2012). However, rubber boots and long pants are strongly recommended – lots of mud and mosquitoes on this hike! 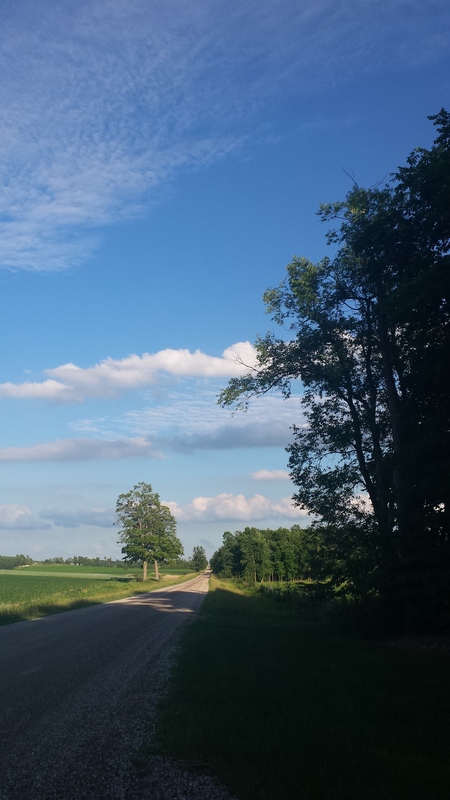 Enjoy a beautiful country drive as you head towards the Maple Keys Sugar Bush.